What is war and why we need peace? Why people tend to negotiate and achieve peace under any circumstances? One can dispute that military interference and loss of lives should always be avoided. Yet, the world history shows that certain wars require radical moves, bold actions, determinations, and if absolutely needed, guns should be taken to fight for freedom. World War II was one of those times when the world needed one leader to stand up against Hitler; someone, who would have courage and toughness of character to put the nation above anything else, including the political parties. Winston Churchill was one of the greatest Prime Ministers of Great Britain, who during the darkest and most crucial times of the nation stood up for them – the way the history and the people expected him to. And even now, when everyone knows about the events of that not very far history, “Darkest Hour” directed by Joe Wright manages to capture the life of this influential political figure in a very dramatic way. Being a politician is similar to being in a marriage – promising to be together for better, for worse, for richer, for poorer, in sickness and in health, to love and to cherish, until death tears the one apart. The story of the film begins on May 9th in 1940. Poland has already fallen, Czechoslovakia has given up to Hitler, Mussolini enjoys himself being a dictator while having the Nazi Germany as his ally. The United States has signed a pact of neutrality and France is next in the line to lose the war even before it widely started. Britain has its own drama going on at home. Prime Minister Chamberlain resigns due to political pressure and because of the loss of trust of his nation in his ability to handle the critical situation. Lord Halifax refuses to become the next Prime Minister, as he does not believe he can govern efficiently being a member of the House of Lords instead of the House of Commons. The choice falls on Winston Churchill – the least likable politician. However, he seems to be the only one capable to do something rational in the given situation. The constitutional monarch George VI offers Churchill to become the Prime Minister, and as soon as Churchill accepts the offer, the entire drama starts to unfold. From one scene to another the viewer is swiftly directed into situations – sometimes also humorous ones – which lead to losing the sense of time and realizing that the war has brought so many issues that we are not proud of. These dark times also give birth to many moments of great significance. 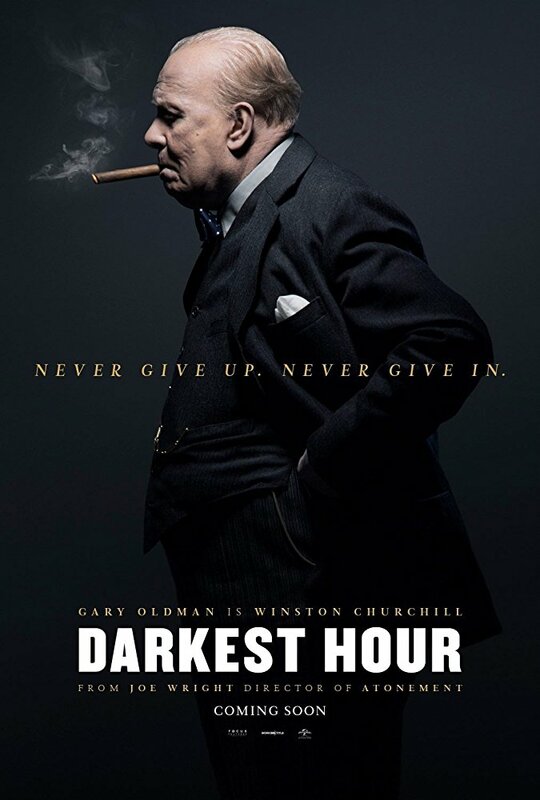 “Darkest Hour” features inspiring speeches of Churchill, an absolutely brilliant train scene, and many others that pay a tribute to the past, and let us admire those moments on the silver screens. In conclusion, “Darkest Hour” must be watched for several reasons. Firstly, it is an accurate portrayal of a sensitive time. In addition, the film has a beautiful soundtrack, an exceptional directing and writing, and last but not least, the editing is exquisite. If I start writing about the long list of stellar cast, this review will get a thousand words longer. To say in a few words, Kristin Scott Thomas plays Churchill’s calm wife Clementine; Lily James is impressive as Elizabeth Layton; Ben Mendelsohn as King George VI, Stephen Dillane as Viscount Halifax, and of course, great and incomparable Gary Oldman who was nowhere to be found in the film – at least, I was unable to recognize him. Still, based on the credits, Gary Oldman portrayed Sir Winston Churchill. I must say, he did it such an amazing way, that I would rather keep myself in the darkness and know nothing about his complete and unrecognizable transformation. Not many will be able to tell the difference between the real Churchill and the actor. If nothing else, at least for Gary Oldman’s astonishing performance, “Darkest Hour” should become a permanent resident on the short list of films that must be viewed regularly.